When you're dealing with a classic like the Krispy Kreme glazed donut, it's reasonable to be wary of some new twist on the original. The original Godzilla is a classic. The 1998 remake... not even Jean Reno's Elvis impression and Michael Lerner's Mayor Ebert could save that. Last year, Krispy Kreme did a fan vote to name a new limited edition donut flavor. The winner was lemon glaze. You may have approached that with a little hesitation. You've been fooled by new versions of good things before. (Looking at you, Chinese Democracy.) But the zesty breakfast dessert proved to be such a hit that Krispy Kreme is bringing it back. The Lemon Glazed Doughnut will be available for one week starting August 27. You can pick one up through Sunday, September 2 at shops throughout the United States and Canada. 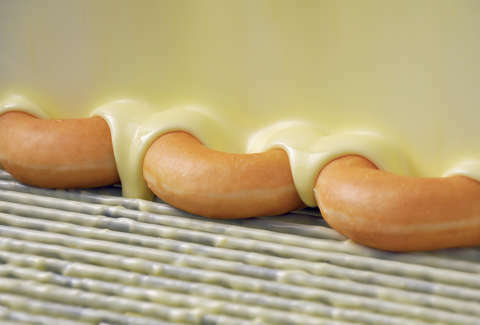 "The Lemon Glazed Doughnut embodies so much of what we love about summer – a season we’re just not quite ready to let go of," said Alison Holder, head of U.S. marketing for Krispy Kreme. "Bringing back the perfect pairing of zesty fresh lemon and sweet Original Glaze is an awesome way to stretch summer out just a bit longer."